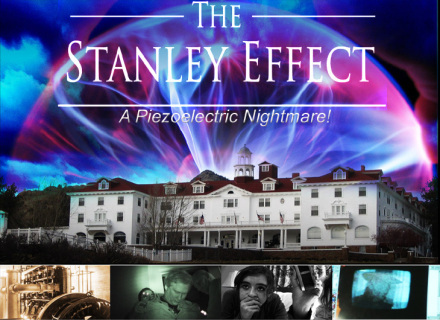 THE STANLEY EFFECT: A Piezoelectric Nightmare! Guests of the Stanley Hotel in Estes Park, Colorado sometimes report odd impressions of unseen children and disembodied voices that can be recorded. Some visitors claim that these and other perceptions can become a physical reality that defies explanation. Watch as we present evidence of the unusual properties of the grounds ability to hold and release energy in ways that are unimaginable. Some of Colorado's finest researchers and various U.S. Government agencies present cases for and against the claims of the earth's ability to record and play back sights, sounds and perhaps even emotions. The Piezoelectric effect of the crystals seem to be amplified by the very power plant that F.O. Stanley built to electrify his grand hotel. Did Stanley unintentionally create the perfect environment for capturing and releasing the essence of events that occur in his magnificent hotel? ORDER YOUR COPY OF THE STANLEY EFFECT DVD TODAY.